My Mother's Day present was delivered this past Sunday. Every single other piece of furniture has been handed down to us. Which I think is impressive since we've got 3700 sq. feet to fill and our house is far from empty looking. I will go ahead and admit it, I'm a hoarder when it comes to furniture. If anyone who knows me well enough is getting rid of any type of furniture, they usually call me. And I usually always take whatever it is. I'm sure I've mentioned before that one of the reasons I fell in love with our house is because of it's easy access attic space. It's helped greatly with my furniture hoarding. My belief is that I might need it someday. I read in a magazine article a year or so ago, that one of my favorite authors, Mary Kay Andrews, also hoarded furniture for years. After years of hoarding furniture, she bought a vacation home on Tybee Island and was able to furnish her entire vacation house with furniture that had been in her basement for years. This is always my argument to David when he begs me to get rid of some of it, since we have a goal to own a vacation home before we're 40. That being said, my house does not look like some eclectic mix of random stuff. I know I don't talk on it much on here, but I'm half way decent with interior design and even with hand me down mix match furniture, I can always make everything work together. I'm known for slapping a coat of paint onto anything. I'm not scared. One thing I've been longing for for some time now is a bigger dinning table. We've been eating off a smaller breakfast room table since the beginning of our marriage and it's worked perfectly. Now though we have the space for something bigger. 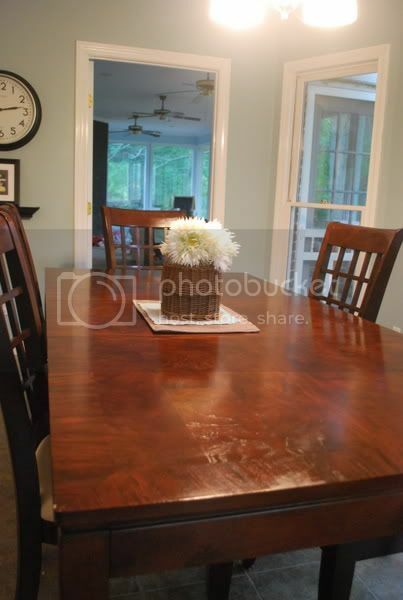 When we first moved in, I put a formal dinning room table (we inherited) in our formal dinning room, but it wasn't really my style and needed some work. We took it down a few months ago and decided to turn the formal dinning room into an office, so we've been crowding people around our little breakfast table since after Christmas. Whenever we have people over, we've been sitting on top of each other when eating. Needless to say, we haven't been having many dinner parties. I've been in love with the farmhouse tables for awhile and naturally, decided that we needed to build one since you can find plans for them all over the internet. It's been on my project list for sometime now, but like a 100 other things, something we just haven't gotten around to. I mentioned awhile back that we had a family member unexpectedly die back in April, well a few weeks ago, it was mentioned that we were about to have to start cleaning out that family member's house and they had some furniture we need to get rid of. 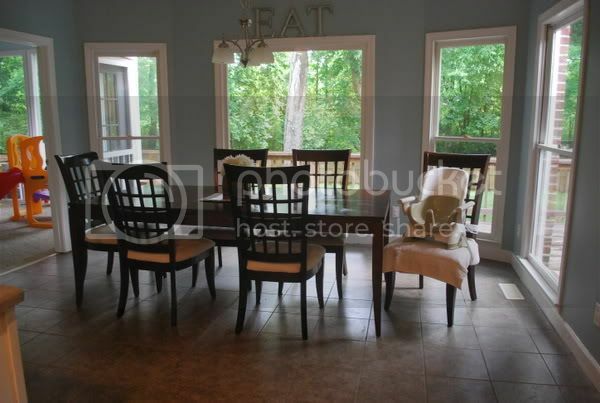 Another family member mentioned to us that the dinning room suit was for sale and we asked if we could possibly purchase it. They named a price and we said "we'll take it!!!" It was a great deal that we couldn't pass up. Since this was a couple of weeks before Mother's Day and I told David, if you can get me that table, I would be extremely happy with it for a Mother's Day gift. I'm happy to say he came through and we have our first what I'm calling "grown up" table. It's over 7ft. long, it doesn't need to be painted, and all the chairs match. We had to take out the buffet that used to be on that side wall to the right, but I love how clean it makes the breakfast room look. The upholstery on the chairs is white, so I'm sure those will be recovered soon. Which is why there is a towel under Olivia's high chair. We had a little chuckle that you could tell there were no kids in their house. I'm excited to finally have a little more table room for guest to eat at and a table that we can eat at as our family grows. David's excited for the fact that when he sits next to me to eat that I will no longer be hitting him with my elbows. He says I protect my food when I eat like I'm in prison. I'm even more excited to say that in staying with our cheap furniture way, we got the whole set for under $100. I'll be sending out dinner invitations soon to eat at the grown up table. Such a privilege to eat at the grown-up table :) Looks great!! Thats a gorgeous table! I love your vacation home goal! My grandma lives on Tybee Island and I just love it out there. I love the set and it looks great in theat room. What is the paint color in the room?? I have been hunting fort he right color for my bedroom and I like that one!